San Diego, CA- Mark Christopher Lawrence speaks to Bullying in this new age of always connected Social Media. We shot this as part of an event connected to "Celebrities Against Bullying" that was shown at a live event on May 14th in Los Angeles. Please repost, like and spread the word. This was a concept that Mark and his wife came up with that could be shot quickly. We had to fit it into the schedule so we were fighting the harsh daylight, ultimately we got a solid simple important message accross. San Diego,CA-Carleton Overstreet Jr. is a drummer, salesman, film and tv guy. Carl first played drums for me when he was 13 in an orchestra pit for "Ramona Quimby" that I was scored, we still play that tune. It's great to see his development and that were all still working together in various modalities. This was shot at Jimmy Loves in San Diego,CA with the band Masterpiece. Carleton Overstreet Jr. is a contributing member of the Kamatoy Media Group. We look forward to more collaborations in the near future. With the recent resurgence back to our Film & TV background it seems appropriate that we would shoot this. Carleton Overstreet Jr., Drummer, Sales, Film & TV Guy from David Kamatoy on Vimeo. Help us out we are about to switch some software up that will help the look of this type of footage. I am posting this as it is on youtube and Vimeo. Which looks better at the HD level? That is the question. San Diego, CA - Mark Christopher Lawrence, Big Mike on NBC’s Chuck, hosts a night of comedy on Tuesday, September 21, at the Cygnet Theatre in Old Town. Headlining the event will be ventriloquist Kevin Johnson, who has appeared with his “friends” on America’s Got Talent and The Late Show with David Letterman. Also in the lineup are Frances Dilorinzo from Last Comic Standing and comic juggler David Kamatoy. David Kamatoy is the #1 Filipino-American comic juggler, quite possibly the only one, and has been entertaining crowds for years in front of the reflecting pond in Balboa Park. 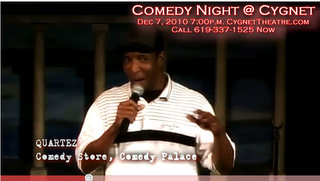 He will bring his mix of humor and juggling as the opener for the evening. Be sure to come out for what Mark Christopher Lawrence guarantees will be “a rib rock roaring show.” Cygnet Theatre is located in San Diego’s Old Town, at 4040 Twiggs Street. For more information, contact the theater at 619-337-1525.